How does your Hyperbaric Chamber work? 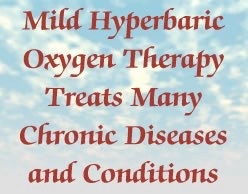 Mild Hyperbaric Oxygen Therapy (mHBOT) Treats Many Chronic Diseases and Conditions. 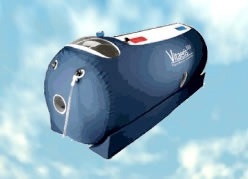 It is a medical treatment in which a person is exposed to increased atmospheric pressure inside an inflatable chamber. The increase in pressure allows more oxygen to reach the cells of the body which has many healing and therapeutic benefits. When the body is under pressure, plasma, cerebral fluid, and synovial fluid will dissolve more oxygen then they would if they were not under pressure. Not only does this increase the amount of available oxygen to the tissues, it allows oxygen to reach areas of the body that would normally be difficult to reach. It allows for healing at the cellular level, which is critical for changes to be made, which in turn affect healthy tissue formation, making it possible for healthier organs and a healthier body overall. Yes! The hyperbaric chamber is completely safe. Since our chambers use filtered ambient air, they can be used regularly without the danger of oxygen toxicity in the body. The majority of clients report a pleasant, comfortable experience. In addition, mHBOT can be safe adjunct to most other therapies. Did you know Steeler Hines Ward uses mHBOT? Check out the details HERE.